The Android Operating System has been slow to come to the Raspberry Pi even though it uses an ARM CPU. 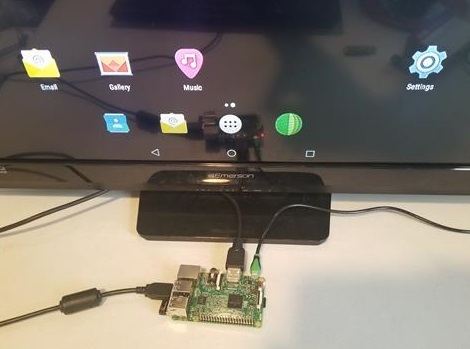 There are a packages floating around that can be installed to a Pi and have Android up and running. I have tried many of them in the past with varying success. Recently I went looking again for an Android OS version to install to the Pi 3 and came across a nice Build from konstakang.com. 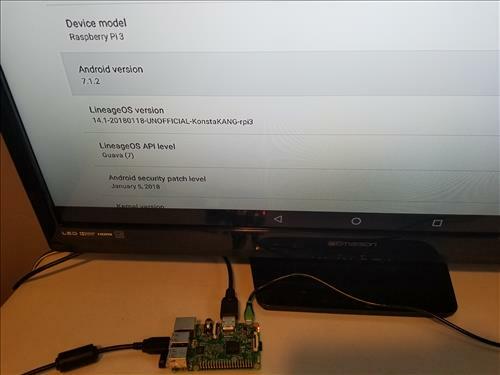 It runs a modified versions of LineageOS 14.1 (Android 7.1.2) setup for the Raspberry Pi 3. It comes with a basic install of a Browser, File folder and a few other Apps. The Play Store is not installed which was fine by me since I load the APK from sites such as Terrarium TV or Kodi. After installing the Android Build from Konstakang I downloaded and installed Terrarium TV and it all worked very well. Kodi is also very popular and can also be installed using a package installer such as OSMC which may be easier if only Kodi will be used. Running Kodi and Terrarium TV on the same OS is nice to have and switching back and forth is the best scenario. Of course many other Apps can be used and installed since it is the Android 7.1.2 OS. 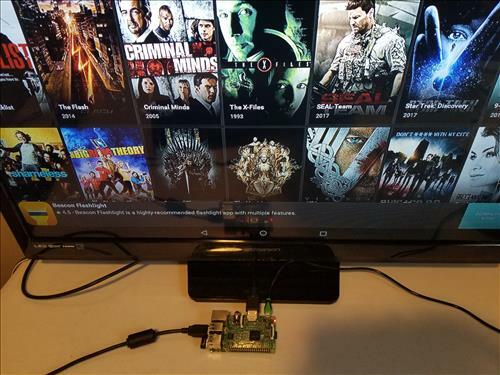 Below is the steps I used to load Android to the Raspberry Pi and Terrarium TV. A video walk-through is at the bottom of the page if needed. 1… The first step is to download the LineageOS 14.1 Android 7.1.2 Build from konstakang.com which has the Download link. 2… After the file is download it will need to be Extracted to get to the Image file. If you are using Windows simply right click on the Downloaded File and click Extract ALL. 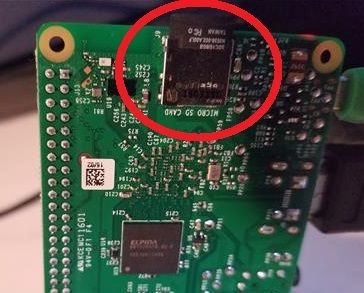 3… Once the Image file is unzipped it can be written to a Micro SD-card the Pi uses. Image writing software is used to write the package to a SD-Card. If you already have Image software use it. 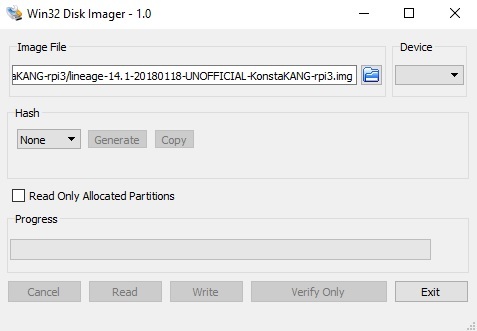 If you dont have any Win32 Disk Imager is a popular free version that can be used. To use it simply load the Extracted Android Image File and Write it to an SD Card. Any SD-Card 8-32GB in size will work. 4… Once the Android Image file is written to the SD card remove it and insert it into the Raspberry Pi. 5… Plug everthing in and a boot logo will display on the screen for a bit. Let it run until the main screen comes up. 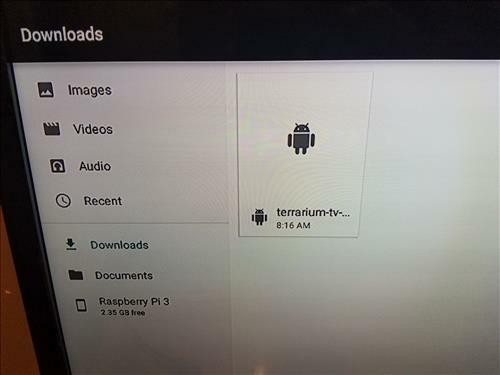 Terrarium TV is a popular APK that streams movies and TV shows. The links for it go up and down and can change. 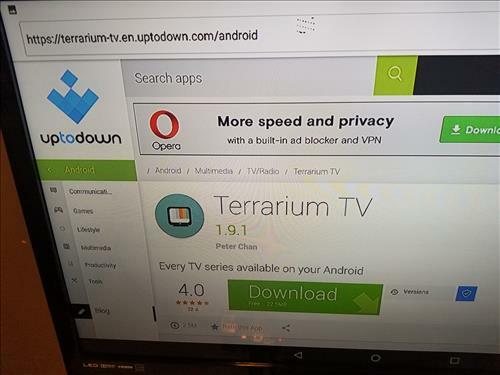 Simply open the default Android Browser, go to the Download page, and Download the Terrarium TV APK. It should open and ask to install. If it doesn’t automatically ask to install open the File Manager go to Downloads and click it to install. Got it to work on my pi 3 and further with terranium tv. It’s just sooooo sloooow. I later downloaded version 15.1 aka android 8.0 Oreo. Had terranium tv working as well. Sane comment….super slooooow. You are right. It’s too slow. It wont play HQ or 1080p video as well as a lot of 720p. They just come out garbled. When booting, the ‘multicolour’ screen appears then I see the lineage os loading and suddenly it disappears and whole process keeps repeating Please help. Check your power supply. Make sure it’s at least 2 amps. Does anyone know how to set up a Samsung remote with this? I’ve seen things saying to turn on HDMI auto-detection however I’m not seeing that in settings. Any help would be appreciated. Thanks. This is by far the best build i have installed, only problem is i have no sound! Can you help? After much difficulty trying to get this to display on my Sony Bravia TV… It kept saying “Unsupported signal, check device output”, I finally found a way to fix it. After trying everything, I simply swapped these two around and it worked! Only problem is now I’ll get some screen flickering and the mouse arrow looks garbled. You mention having both Kodi and terrarium in a switchable setup… How to about that as writing either of the images wipes the SD. You’re implying a dual boot osmc/openelec and android. It would be nice to include some details. Go to https://kodi.tv/download and download the Kodi APK file. It will be under the Android logo and version ARMV7a (32)bit. Installing the Kodi APK should have it up and running no need for a dual boot. Do this work on Raspberry Pi 3 B+? I am having the same Problem. Did you found a solution ? How can i run Kodi and Terranium tv on the same OS the file for Kodi will not open, mentioned OSMC package installer but wont this corrupt the \OS. Would I be able to control gpio pi s? I have same problem, any help? IS it possible to install google play store on this? Yes… log into your google account on Raspberry Pi 3 and pc. Install play store on pc, however select RPI3 to install instead og on the pc you are using to install. I try these steps but i haven’t the RPI3 device that i can select. What do i Miss here? I would like to install Play Store too but do not understand what you mean. How can I install play store on PC but choose RPI3? I have looked on PC and see no way to do this. ok it also creates 2 more drive space and ask to format. Do I format those 2 or just leave them? After startup it just says unsupported signal.